I’m happy to let you know about a new book from my dear friend, Madisyn Taylor, co-founder of DailyOM. 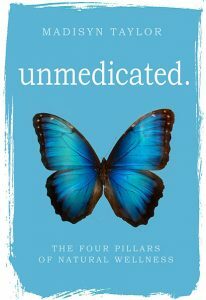 It is a gentle and accessible step-by-step guide to moving from excessive reliance on medications to fundamentally healing yourself through four pillars of natural wellness. Madisyn was plagued by depression and anxiety, suffering from chronic physical problems that left her desperate for solutions. Spending decades searching for answers, she first turned to the medical community, which put her on a rollercoaster course of numerous doctors, tests, and an unhealthy reliance on medications that left her numb and lifeless. “Learning to heal myself through natural means, I came to the profound realization that my healing path is a lifelong process. The motivation and desire to be happy and healthy in the most natural way possible stemmed from an authentic part of myself, and it is from this authenticity that real change lasts forever. I also came to discover that healing does not have to be expensive, dramatic, or complicated. Healing can be inexpensive, drama free, and simple. By “simple” I do not mean easy; though I don’t consider my process difficult by any means, it does take dedication. Most people are looking for a quick fix, or a pill to make their life better, or the next fad diet, or a guru who will change their life forever. People look everywhere outside themselves in order to avoid facing the truth of what is inside. I want to tell you that there is power in simplicity and there is strength in building a foundation from within.